Everyone loves a carrot cake; and now it’s the turn of the carrot energy bar. 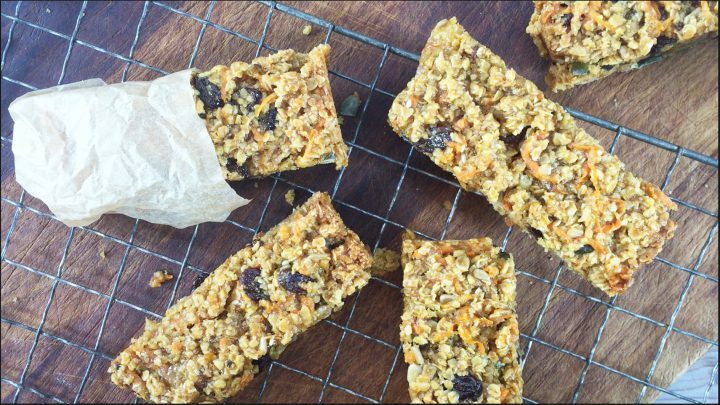 The inclusion of carrots and seeds really whack up the fibre content of tasty bars – there’s 3.4g in a single slice. Go on, give them a go today. Pre heat the oven to 190°C, 170°C fan, gas 5. Line a shallow 23cm square or 18x28cm rectangular cake tin with baking parchment. Mix and spread into the tin. Press down well with the back of a wooden spoon then bake for 30-35 mins until golden brown. Leave to cool in the cake tin then turn out and cut into slices with a sharp knife. These will keep in a tin for 3-4 days.